Not a species itself, Graptoveria is a hybrid between Echeveria and Graptopetalum, and a number of garden worthy plants carry the name. 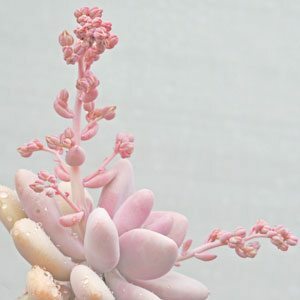 The best known may well be Graptoveria ‘Fred Ives’, typical of the variety, this is low growing, clump forming and actively growing in the summer months. These are drought tolerant, they ill cope well with light shade, and even grow well with moderately wet winters, as long as drainage is good. Use a specialist succulent and cacti potting mix, which will provide the drainage required. A frost free position is important as is an environment that has low humidity. G. acualis – Clusters of pinkish grey rosettes. G. moonglow – Thick green leaves blushed with pink. G. fanfare – Narrow pale blue to green foliage. G. Douglas Huth – Brilliant Pink to Red in full sun, blushed with pink in part shade. These are a hybrid plant so vegetative propagation is the only way to successfully propagate Graptoveria. The easiest method of propagation is by removing offsets, however this depends on the species. Leaf cuttings are also reliable.